Losha is an online lingerie store, having women undergarments best in quality, style and value for money in the widest possible range. Great lingerie, unfortunately, is not that one same good bra in your closet that you call your favorite. Just like all women are different, so are their lingerie needs. 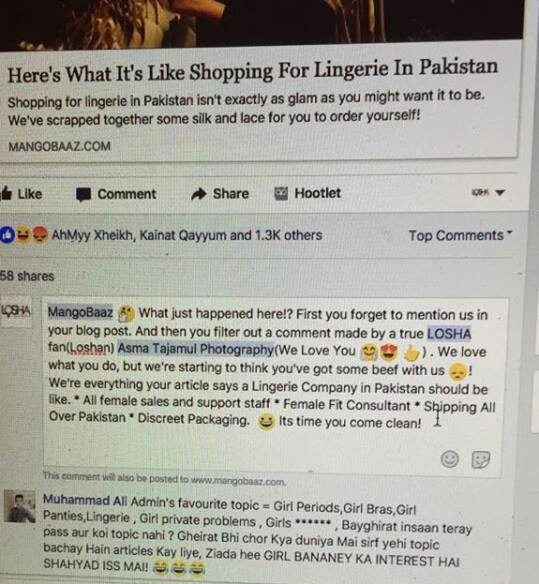 Recently, Mangobaaz published an article about lingerie shopping places in Pakistan. However, in that article, it didn’t mention Losha, the most happening online lingerie store. We even commented on Mangobaaz’s post that they forgot to mention us while we are everything and fulfilling all the criteria that their article talks about i.e. a lingerie company, all females sale support staff, female fit consultants, shipping all over Pakistan and discreet packaging. 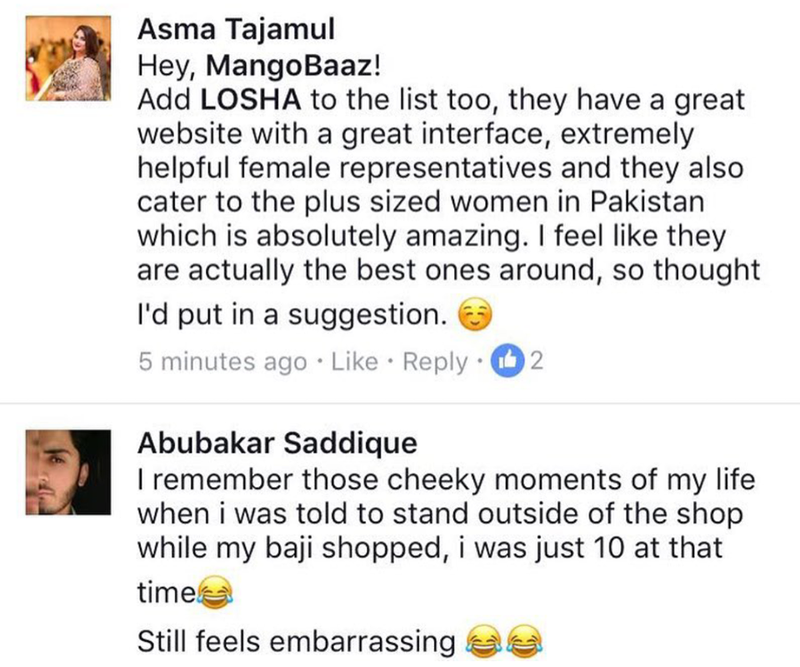 We were glad to see that in retort to this MangoBaaz article about the problems of lingerie shopping in Pakistan, one of our long term and loyal customers shared her experience and acknowledged Losha in her comment on the same post. We at Losha were so delighted and feel privileged to have such faithful customers. Moreover, Losha is honored and pleased to know that it has actually helped women in Pakistan to overcome the difficulties they have to face when it comes to lingerie shopping. So we sent a surprise package as a sign of acknowledgement and happiness her way. We wanted to acknowledge her loyalty, plus we were super happy to see that Losha is actually helping people, and that people are now mentioning it in places. 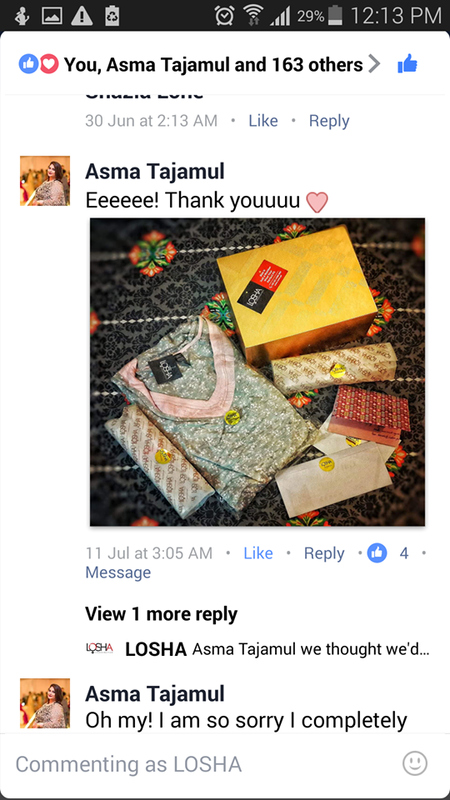 She was overjoyed to receive the surprise package, that we sent her way and wrote us back too! There is so much social discomfort attached to buying lingerie in Pakistan. Therefore, we aim to serve women of all shapes, sizes, tastes and budgets. Losha is privileged to have such faithful customers. Moreover, we are honored and pleased to know that our brand has actually helped women in Pakistan to overcome the difficulties they have to face when it comes to lingerie shopping.